US, 1933, 78 minutes, Black and white. Robert Montgomery, Helen Hayes, Louise Closer Hale, John Beal, Henry Travers, Margaret Hamilton. 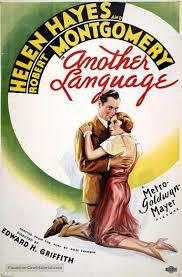 Another Language seems an unlikely title for a film, especially in the 1930s. The title refers to a wife and her experience of her husband’s extended family who certainly do not approve of her, who are a joking group and who are close-knit, especially under the influence of a very dominating mother, played by Louise Closer Hale, a manipulator of emotions of the highest order, making a martyr of herself, and also dominating her long-suffering husband, Henry Travers. The wife is played by Helen Hayes, popular at this time, winning an Oscar for Best Actress for The Sin of Madelon Claudet, and appearing with Gary Cooper in the 1932 version of Hemingway’s A Farewell to Arms. in 19 seventies she was to win a second Oscar, full Best Supporting Actress in Airport. The leading man is Robert Montgomery, very popular at MGM in these years who was to have a long career as actor and move into directing. John Beal plays his nephew, a misfit in the family, who wants to be an architect but is derided by the family and pressurised to go into business. Helen Hayes is very sympathetic as Stella, trying to be agreeable to the disagreeable family, doing some art classes in sculpture, loving for her husband – who more and more is offhand with her, imitating the rest of his family. It is when the young nephew becomes infatuated with Stella that things come to a head, that Stella has to make decisions about her life, her life and the harassment and relationship with his family, and for him to come to some kind of realisation as to what has happened. Fortunately, he does. A small film, more suited as a supporting feature. 1. The title, meaning? Not expected title for a popular movie? 2. The writers, experience of plays, screenplays? Strong characters, settings, dialogue? 3. 1933, black-and-white photography, interiors, cast, contemporary look and style, the musical score? 4. Stella and Vic, their marriage, happy, on the boat for the honeymoon, arriving at the port, the relations all present? Idyllic but about to change? 5. Meeting the family, the effect of the marriage, the family’s general disapproval? The visits, the comments? Three years passing? Stella putting up with the criticism? Time for decision? 6. The mother, her attitudes, love for her sons, possessiveness, haughty manner, her pretences, fainting and being ill, the support of her husband and his being quiet? Manipulating people? The father as a patient man, always friendly towards Stella? 7. The rowdy family, gatherings, the sons and boisterous, the jokes, their wives? The daughters? Helen as a hard case – but more sympathetic than the others? The attitude towards Stella, criticisms, laughing and mocking, not really accepting her as herself? The imposition of family expectations and how everybody should be? Family demands? 8. Jerry, his dream of being an architect, the family against it, forcing him to go into business, the effect on him? His visits, awkward, Stella and her support, his falling in love with her, his anger at Vic’s treatment of her? The walk in the rain, the talk, the dog in the window, his buying it and later bringing it as a gift? Stella supporting him? His return for the evening at Stella’s, the gift of the dog, her holding him back, causing the scene, the return, staying with Stella till 3 AM? Is kissing her, her reaction? His walking the streets, coming to the family house, people commenting that he was in love, his trying to keep his attitude private? 9. Stella, in herself, her love for Vic, making a home, the Tuesday nights at the family house, the continued criticism, her going to art school, sculpting, the bust of her husband – and later being broken in the quarrel? Late for the dinner, the family all coming to visit Stella and Vic, preparing the food, the sandwiches, the daughters and their friendliness, the raucous brothers, the mother with her tantrum, collapsing, criticising the stairs, leaving in a huff? 10. Vic, dependent on his family, expecting Stella to be the same, imposing on her, his harsh comments and judgements, taking her for granted, wanting her to apologise? His making up stories about Jerry to help? Stella, her reaction, leaving, he staying away the night, phoning her to come to apologise to his mother? 11. Stella, arriving, the apology to the mother, wanting to leave to have time for herself, Jerry’s return, Jerry’s father and his severity, Vic and his lying, then a dawning on him what had happened? The mother coming down, intervening? Vic and his beginning to understand, his leaving with Stella, the mother upset and wanting him back? A future for Stella and Vic? 12. An old story, looking old – but perennial?